Happy Fiesta Friday!! We made it through another week and now it is time to celebrate. What better way to celebrate than with good food, drinks and good company. I don’t know about you but this makes me feel festive indeed! One of my favorite dishes ever is Chicken Pad Thai. My first time to try this wonderful Asian dish was in Austin, TX at a place called Madam Mam’s. Madam Mam’s has wonderful Thai Food Cuisine. If you are ever in Austin and want good Thai Food then this is your place. I miss Madam Mam’s and her Chicken Pad Thai so I decided to try and make it at home. I found these recipe’s online and experimented a little to make it my own. I think it is pretty easy (even for me) and really close to how Madam Mam makes it. Maybe it will become a favorite for you. 1. Bring a large pot of pot to a boil and dunk in your rice noodles. Turn down the heat to low and keep an eye on them: you will be frying the noodles later, so you don’t want to over-soften them now. Noodles are ready to be drained when they are soft enough to be eaten, but still firm and a little “crunchy”. Drain and rinse with cold water to prevent sticking. Set aside. 2. Make pad Thai sauce by combining the sauce ingredients together in a cup. Stir well to dissolve tamarind and brown sugar, and set aside. Note: this may seem like a lot of sugar, but you need it to balance out the sourness of the tamarind. 3. Place chicken slices in a small bowl. Stir together the marinade and pour over chicken. Stir well and set aside. 4. Warm up a wok or large frying pan over medium-high heat. Add 1-2 Tbsp. oil plus garlic. Stir-fry about 30 seconds. Add marinated chicken. When wok/pan becomes dry, add a little chicken stock, 1-2 Tbsp. at a time, to keep the chicken frying nicely (5-7 minutes, until cooked is cooked). 5. Add the noodles, and pour the Pad Thai sauce over. Using two utensils, use a gentle “lift and turn” method to fry noodles (like tossing a salad). Stir-fry in this way 1-2 minutes. If you find your wok/frying pan too dry, push noodles aside and add a little more oil to the bottom of the pan. 6. Add the bean sprouts and and continue frying 1 more minute, or until noodles are cooked. Noodles are done to perfection when they are no longer “hard” or crunchy, but chewy-sticky wonderful! Taste-test for seasoning, adding more fish sauce until desired flavor is reached (I usually add 1 more Tbsp. fish sauce). Toss well to combine. 7. Lift noodles onto a serving plate. Top with generous amounts of crushed/chopped nuts. Wonderful job on making your own Arl! Thank you Lori! It is not as good, but it wasn’t bad for my first try. Hi Arl – so nice to ‘see’ you at Angie’s again! 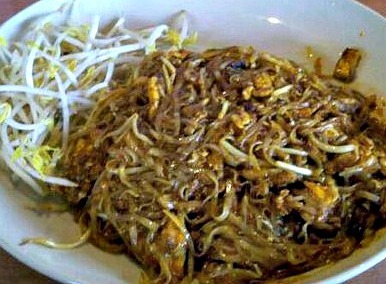 I love Pad Thai and think it is wonderful that you have to re-create it as you can’t get any locally! Good work! I love it with lots of lime juice squeezed over it too – it is how it is served at my local restaurant and now I always request a wedge of lime to go with it! Thanks for bringing this to the party – Happy Fiesta Friday! Hi there! Thank you so much! And you are welcome. 🙂 I have never tried it with lime juice …I will do this next time. Hope you have a great weekend! 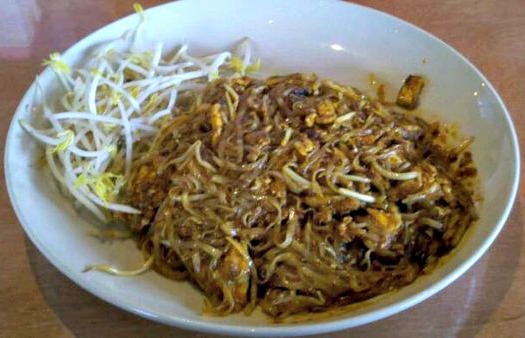 I feel so ignorant when people talk about Pad Thai. Why? Because honestly, I never had it before. Poor me! Well, maybe because something scares me to try new foods I am not so familiar about. You are so welcome! Thank you! 🙂 I was lucky with this one …first time I tried it I loved it. However, there are times I do try something new and do not care for it …then I am more likely to go back to the tried and true meals I love on the menu. mmm pad thai! I’ve been looking for a good pad thai recipe, I will have to try this one soon! I’m so with you about making your own rather than heading for the take away… better for the purse and the belt, I’m sure! Yummm…there’s a Thai place that my boyfriend and I like to get take-out from when we’re really in a time crunch, but I have yet to try making my own Pad Thai. This looks delicious – I’ll have to give it a go sometime soon! Thank you, and yes you should. Although if I had delivery I may never had made it. 😉 Mine turned out okay …but not near as good as Madam Mams. 🙂 Thanks for stopping by!